I decided the children in my Victorian neighbourhood needed to improve their education and thought it would be fun to create a schoolhouse for them. The main materials used were scrap pieces of wood and left-over paint. The walls were cut from plywood and the base was made from a thicker piece of wood (MDF) to add stability. I kept the shapes simple since my carpentry skills are quite limited. The most difficult part was keeping the pieces 'square' and cutting the doorway with a jigsaw. 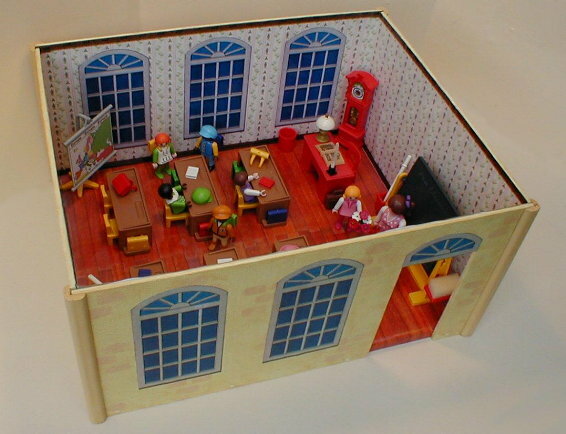 The windows were photocopied from a cardboard Barbie house but reduced in size. The wallpaper and floorboards were also photocopies, taken from a wooden dollhouse still waiting to be built (one day!). These were glued in position after the walls were painted. Clear sticky-back plastic film was applied to the inner walls and floor to provide an easy to clean, durable surface. All the decorating was completed before the walls were nailed to the base and dowel was glued to the outer corners to provide some (well-needed!) support. The final stage was sealing the outer walls with a coat of varnish. 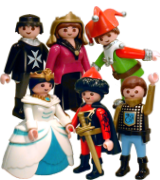 The furniture, figures and accessories come from a variety of sets. 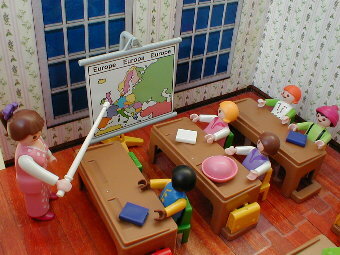 The blackboard, horse poster/Europe map, yellow chairs, book, briefcase, teacher and some pupils are from the Victorian Classroom (5314). 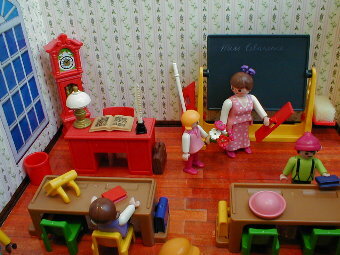 After deciding the grey desks and teacher's chair included with that set looked too modern, they were replaced with other items. 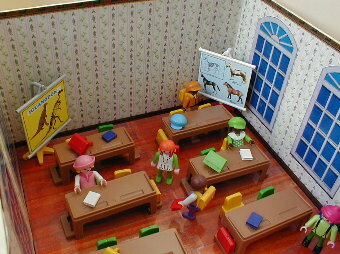 The brown desks, green chairs and dinosaur poster/world map come from set 3522 - Classroom. 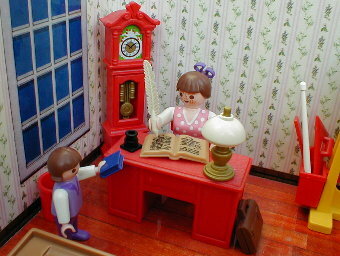 The teachers desk and chair, clock, feather pen and lamp are from the old Advent Calendar 1998 - Santa's Workshop (3974).